TWO distinct categories according to motives: Economic regulation (e.g. controls over interest rates and credit allocation) aims to mitigate market failures in the allocation of resources. Prudential regulation aims to protect the stability of the financial system (i.e. 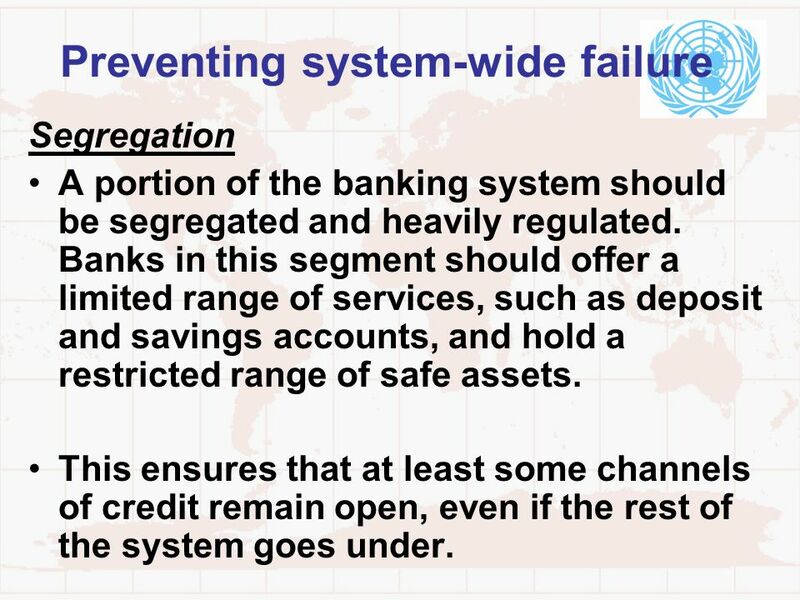 prevent systemic failures or financial crises) and to protect depositors, especially small depositors. The distinction between economic & prudential regulation was often missed or ignored. The fact that market failures are pervasive in the financial sector has often been overlooked or ignored in the pursuit of financial sector liberalisation. 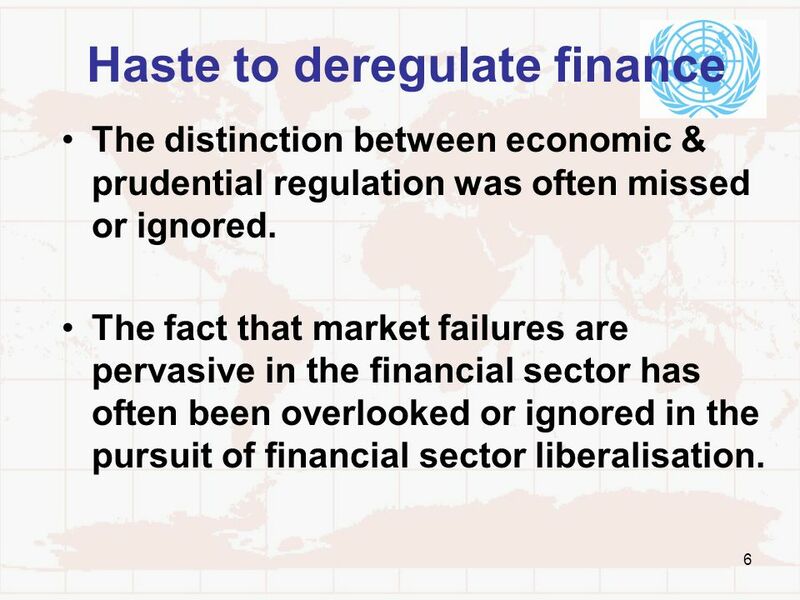 Dismantling or lack of strong prudential regulation is identified as the root cause. Therefore, discussion of regulatory reforms focuses mostly on prudential or macro-prudential ones. However, a laissez-faire approach to “economic regulation” and the deregulation of interest rates can also be contributory factor. That is, excessive bidding for deposits leads to higher interest rates. Thus, banks must charge higher rates for loans which attract risky borrowers. 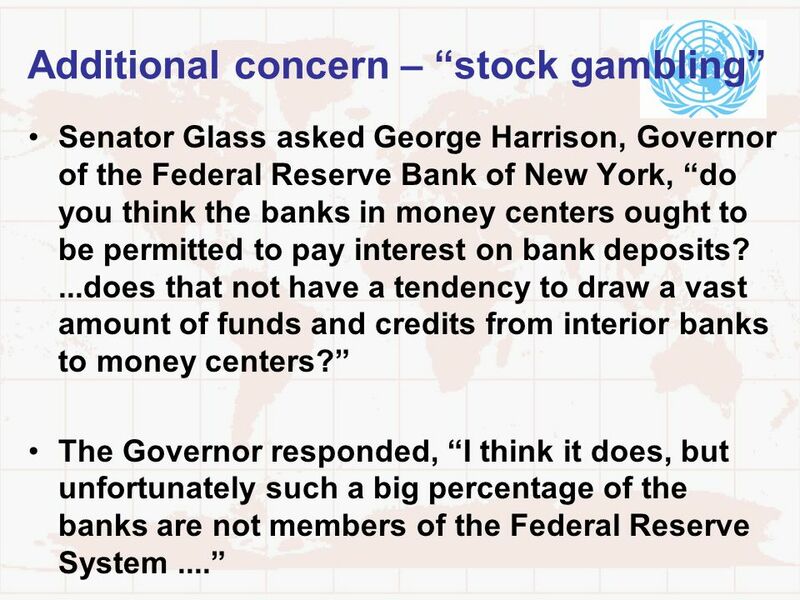 9 Glass-Steagall Act: what were the concerns? Excessive interest on deposits as a threat to both the liquidity and solvency of banks. Especially when there were too many banks competing for deposits, squeezing profit margin. Evidence of the deterioration of FIs’ asset portfolios was already emerging in 1996 Korea: banks suffered losses on their equity portfolios in 1996 Thailand: one bank was taken over by the authorities in May 1996 after incurring heavy losses through a speculative and fraudulent lending policy; some finance companies also suffered heavy losses in 1995 after lending for stock market speculation. 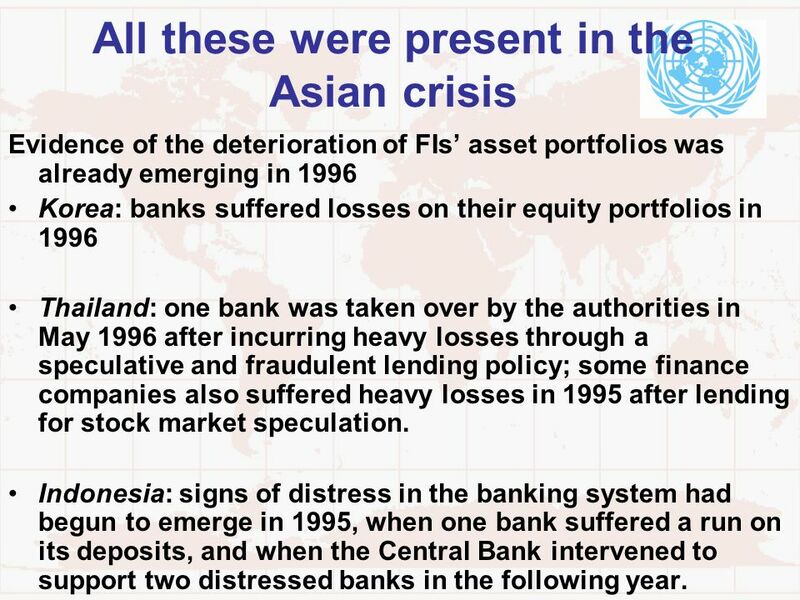 Indonesia: signs of distress in the banking system had begun to emerge in 1995, when one bank suffered a run on its deposits, and when the Central Bank intervened to support two distressed banks in the following year. Opening up banking systems to new entrants lowered the franchise value (expectation of future profits) of existing banks. For example, in Thailand, the entry of foreign banks increased competition for prime customers. The increased competition squeezed the lending margins of the domestic banks, inducing them to move into more lucrative, but more risky, activities. This shift in activities by the domestic banks was facilitated by a relaxation of the regulations governing permissible activities of banks. 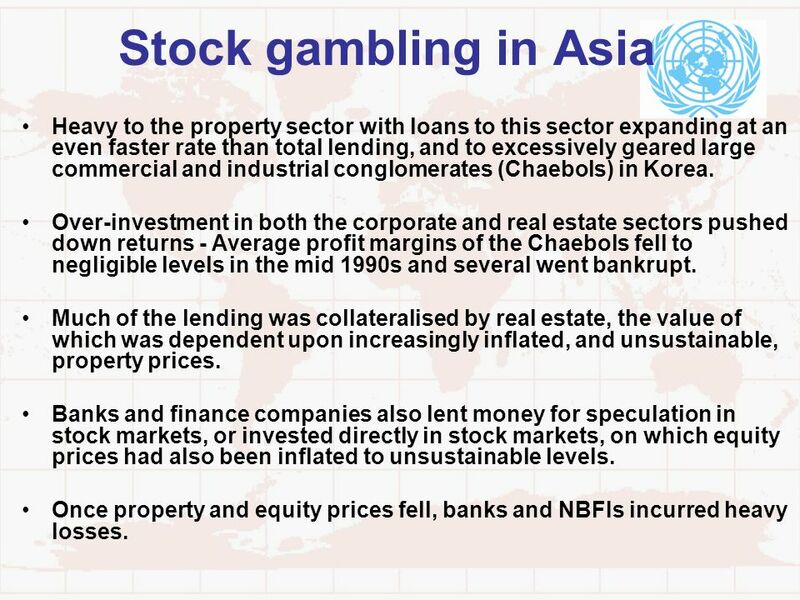 14 Stock gambling in Asia Heavy to the property sector with loans to this sector expanding at an even faster rate than total lending, and to excessively geared large commercial and industrial conglomerates (Chaebols) in Korea. Over-investment in both the corporate and real estate sectors pushed down returns - Average profit margins of the Chaebols fell to negligible levels in the mid 1990s and several went bankrupt. Much of the lending was collateralised by real estate, the value of which was dependent upon increasingly inflated, and unsustainable, property prices. Banks and finance companies also lent money for speculation in stock markets, or invested directly in stock markets, on which equity prices had also been inflated to unsustainable levels. Once property and equity prices fell, banks and NBFIs incurred heavy losses. Deposits/savings flowed from the rural economy to the commercial sector or non-traded activities such as real estates. 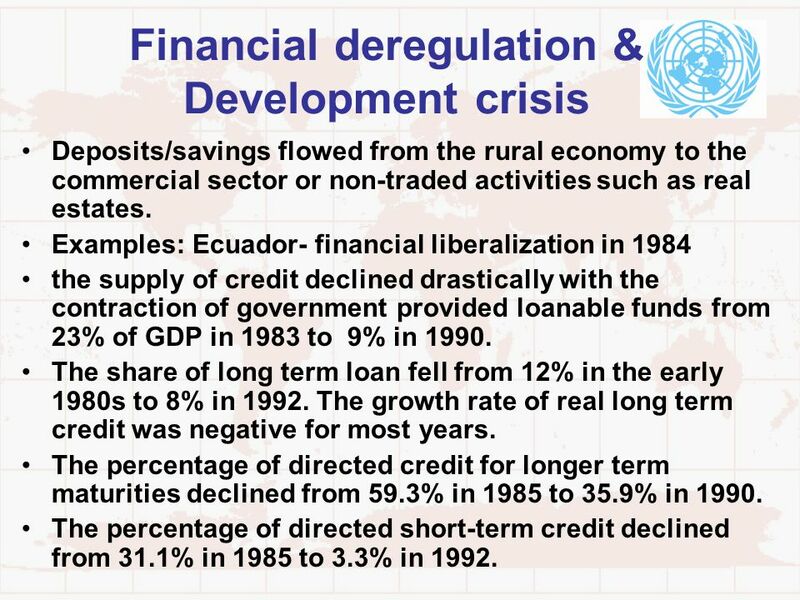 Examples: Ecuador- financial liberalization in 1984 the supply of credit declined drastically with the contraction of government provided loanable funds from 23% of GDP in 1983 to 9% in 1990. The share of long term loan fell from 12% in the early 1980s to 8% in The growth rate of real long term credit was negative for most years. The percentage of directed credit for longer term maturities declined from 59.3% in 1985 to 35.9% in 1990. The percentage of directed short-term credit declined from 31.1% in 1985 to 3.3% in 1992. 1983 0.254 0.309 1986 0.374 0.308 1990 0.211 0.218 1995 0.173 0.159 1998 0.161 0.146 Agriculture 1: Based on bank advances by main economic purposes Agriculture 2: Based on bank credit by sectors (private and public). 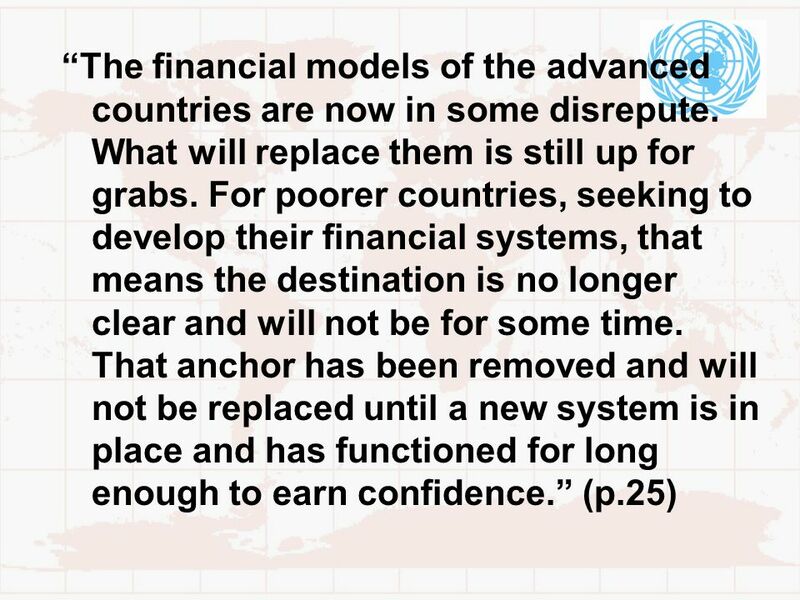 The less sophisticated financial systems in developing countries weathered the crisis better than their more elaborate counterparts in the West. 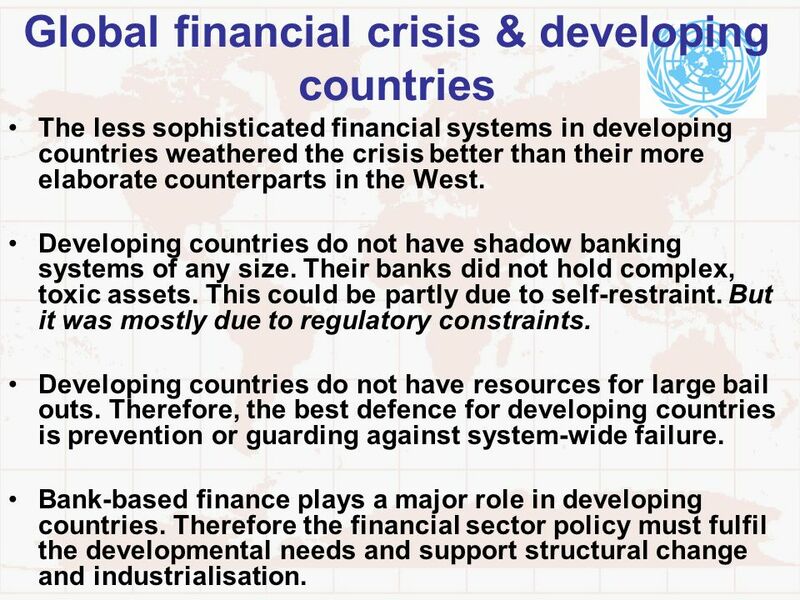 Developing countries do not have shadow banking systems of any size. Their banks did not hold complex, toxic assets. This could be partly due to self-restraint. But it was mostly due to regulatory constraints. Developing countries do not have resources for large bail outs. Therefore, the best defence for developing countries is prevention or guarding against system-wide failure. 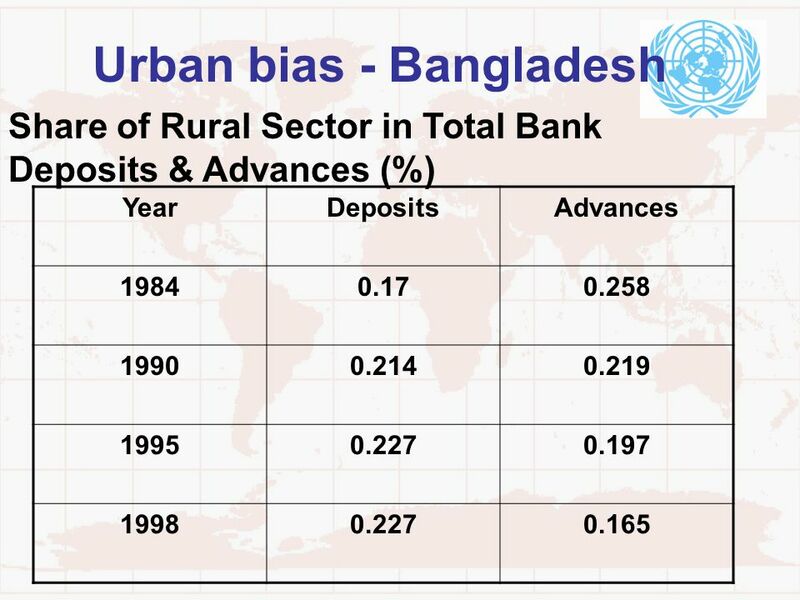 Bank-based finance plays a major role in developing countries. Therefore the financial sector policy must fulfil the developmental needs and support structural change and industrialisation. Segregation A portion of the banking system should be segregated and heavily regulated. Banks in this segment should offer a limited range of services, such as deposit and savings accounts, and hold a restricted range of safe assets. This ensures that at least some channels of credit remain open, even if the rest of the system goes under. 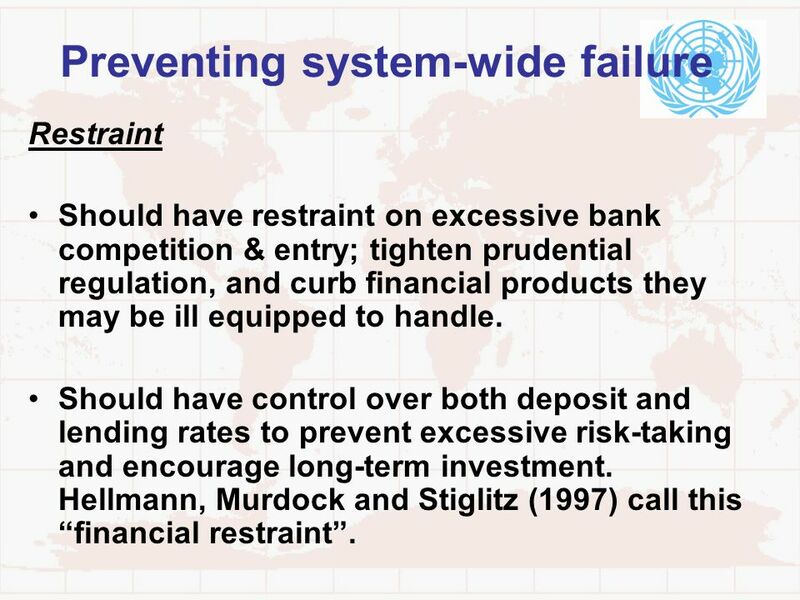 Restraint Should have restraint on excessive bank competition & entry; tighten prudential regulation, and curb financial products they may be ill equipped to handle. Should have control over both deposit and lending rates to prevent excessive risk-taking and encourage long-term investment. 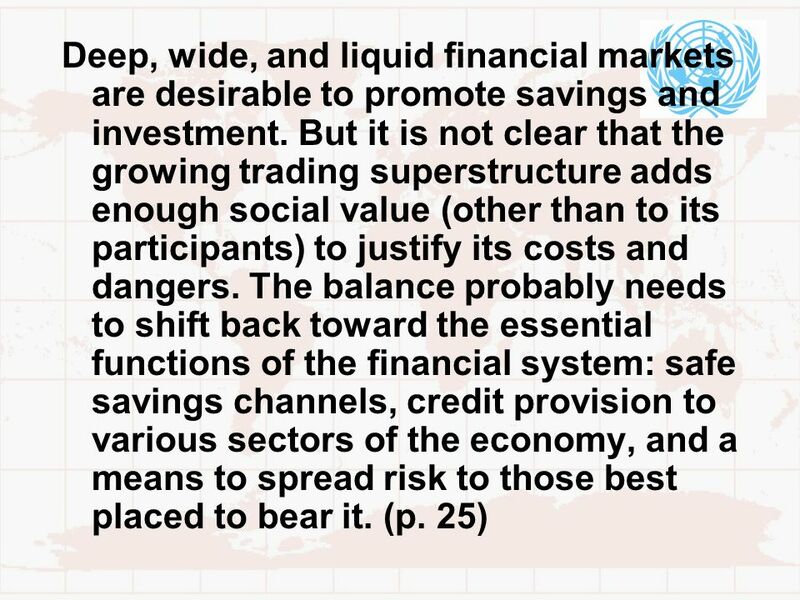 Hellmann, Murdock and Stiglitz (1997) call this “financial restraint”. 21 Ownership matters Banks in the regulated and segregated sector do not have to be natural monopolies, nor do they have to be government-owned. But large state-owned banks provide a layer of reassurance. Even though they may lag behind their private competitors in boom times, they remain the main vehicle for maintaining the credit line during bad times. 22 Ownership matters A country needs major domestic players, which can participate in implementing a crisis response. Therefore, domestically owned banks must dominate the financial sector. Foreign banks will have divided loyalties at best, and may be wholly preoccupied with events in their home countries. 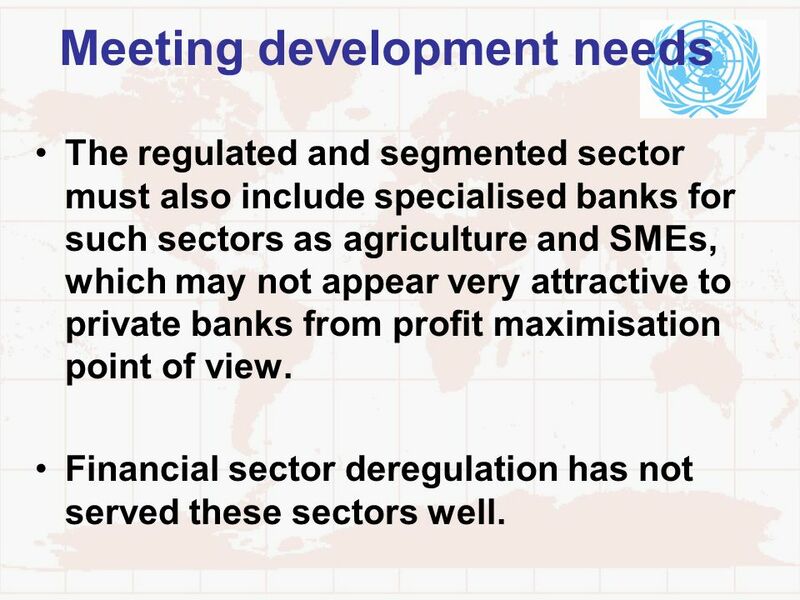 The regulated and segmented sector must also include specialised banks for such sectors as agriculture and SMEs, which may not appear very attractive to private banks from profit maximisation point of view. Financial sector deregulation has not served these sectors well. Through careful control of the financial sector (keeping the real interest rate low and encouraging/directing credit to priority sectors) Japan and other East Asian countries experienced enviable economic growth and structural transformation. 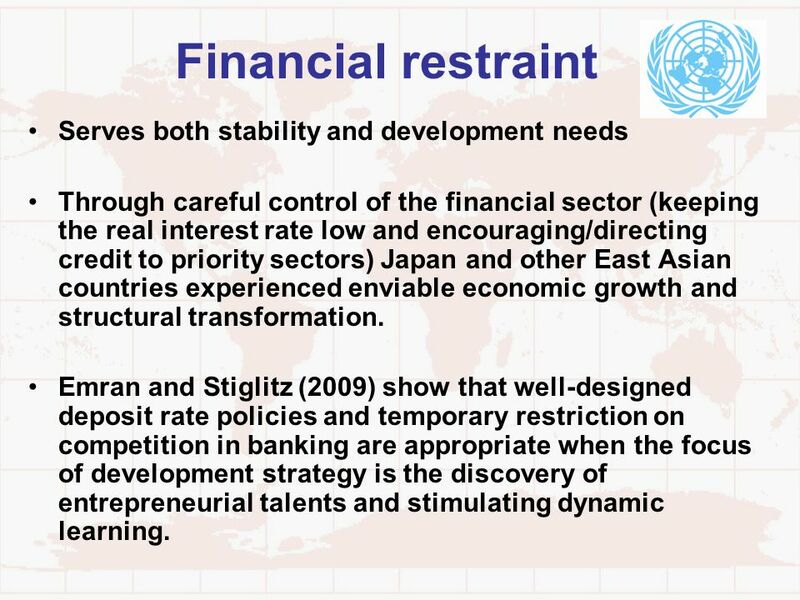 Emran and Stiglitz (2009) show that well-designed deposit rate policies and temporary restriction on competition in banking are appropriate when the focus of development strategy is the discovery of entrepreneurial talents and stimulating dynamic learning. 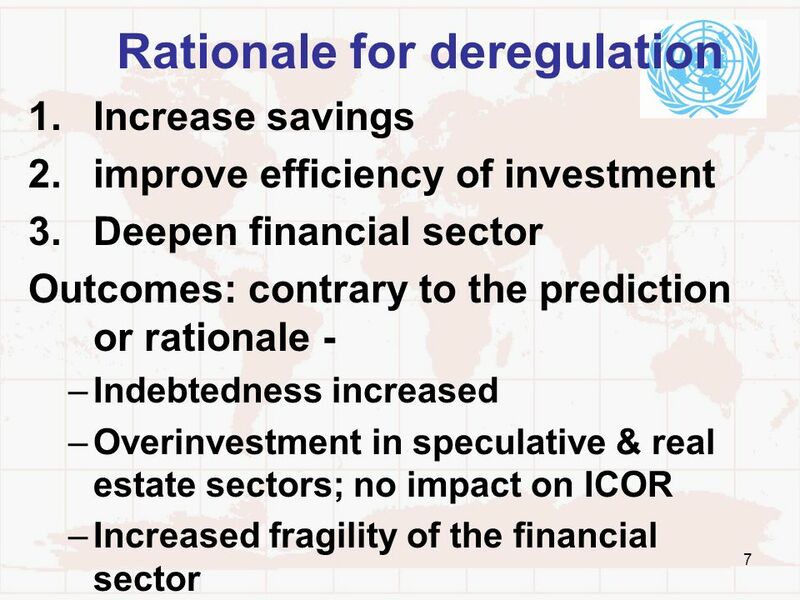 Although the Table has set up the different types of financial regulation as seemingly mutually exclusive categories, in reality different regulations have effects that cut across their designated domain. e.g. global credit controls that stem from macroeconomic objectives also fulfil a prudential function to the extent that they restrain banks from imprudent expansion of credit. Develop and improve legal systems and information disclosure. Impose rate ceilings on bank deposits. Establish limits either on the rate at which banks can expand credit or on the rate of increase in their exposure to certain sectors, such as real estate. Require greater diversification of bank portfolios. Reduce the restrictions on the range of activities in which banks can engage. 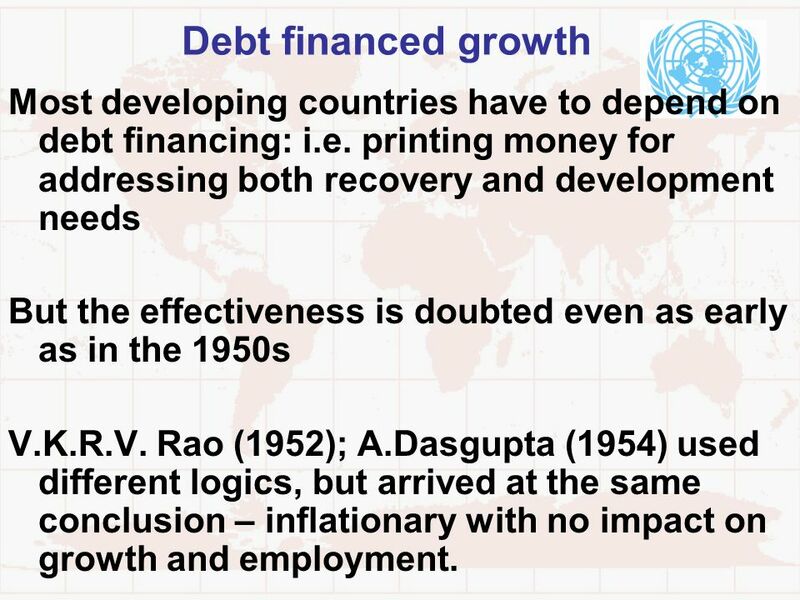 30 Debt financed growth Most developing countries have to depend on debt financing: i.e. printing money for addressing both recovery and development needs But the effectiveness is doubted even as early as in the 1950s V.K.R.V. 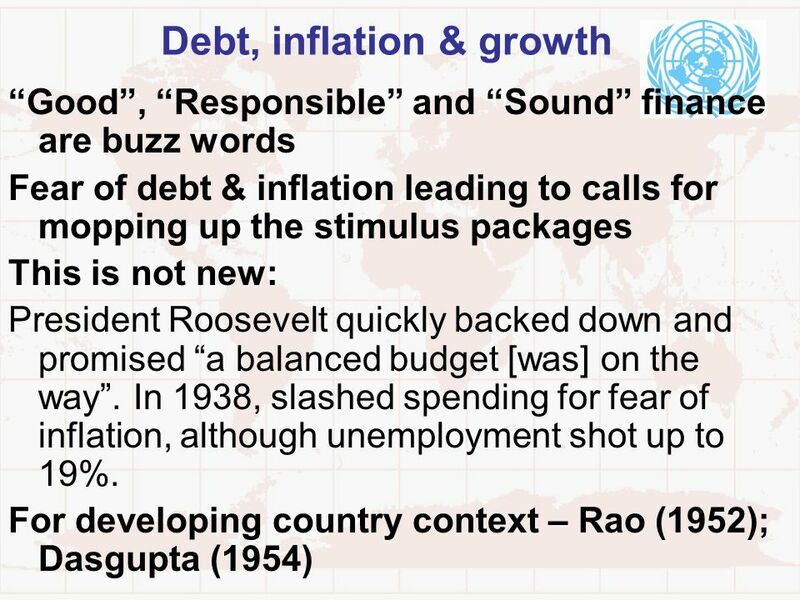 Rao (1952); A.Dasgupta (1954) used different logics, but arrived at the same conclusion – inflationary with no impact on growth and employment. 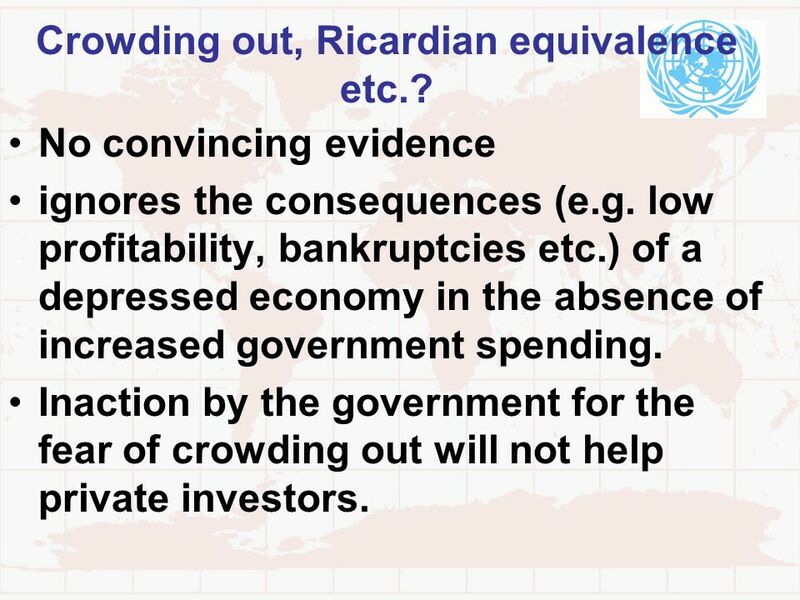 33 Crowding out, Ricardian equivalence etc.? No convincing evidence ignores the consequences (e.g. low profitability, bankruptcies etc.) of a depressed economy in the absence of increased government spending. Inaction by the government for the fear of crowding out will not help private investors. 34 Deficit & interest rate? 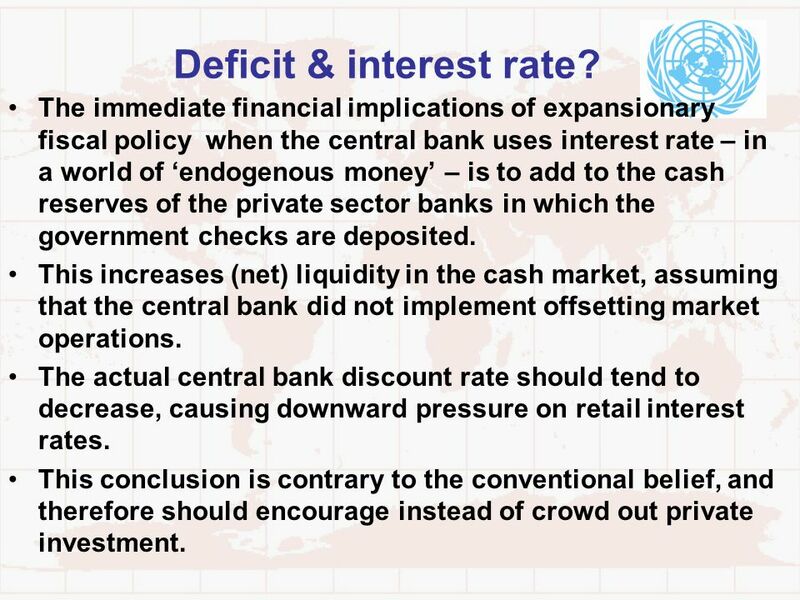 The immediate financial implications of expansionary fiscal policy when the central bank uses interest rate – in a world of ‘endogenous money’ – is to add to the cash reserves of the private sector banks in which the government checks are deposited. This increases (net) liquidity in the cash market, assuming that the central bank did not implement offsetting market operations. The actual central bank discount rate should tend to decrease, causing downward pressure on retail interest rates. This conclusion is contrary to the conventional belief, and therefore should encourage instead of crowd out private investment. 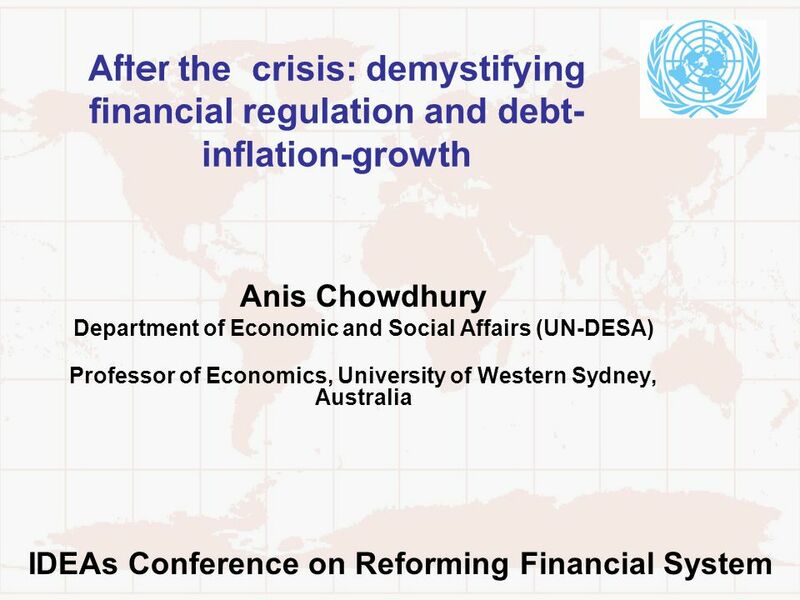 Download ppt "Anis Chowdhury Department of Economic and Social Affairs (UN-DESA)"
Is Global Keynesianism Possible? 10 April 2009 Beijing China. 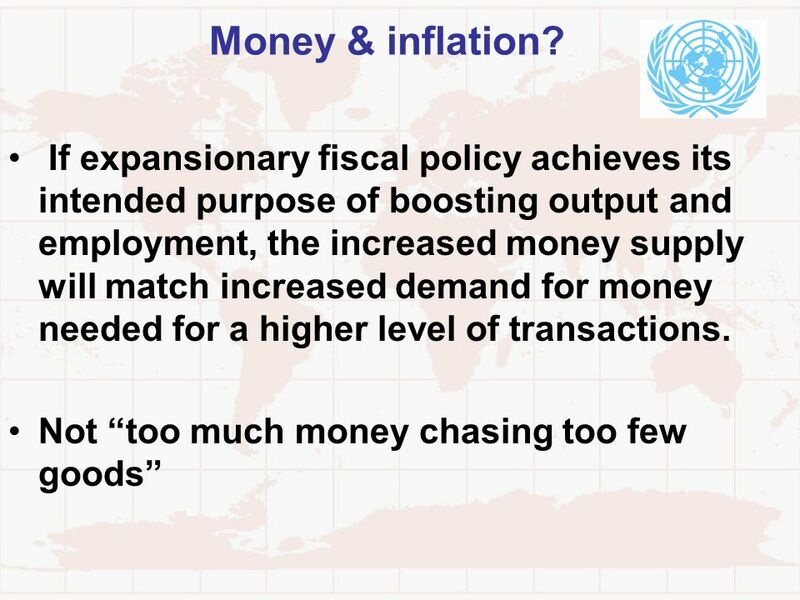 MONETARY POLICY IN ISLAMIC FRAMEWORK Ausaf Ahmad Azerbaijan State Economics University Baku April 7-11, 2008. The Macroeconomics of Public Expenditures Vandana Chandra, PRMEP PEAM Core Course January 12, 2004. Copyright © 2002 by The McGraw-Hill Companies, Inc. All rights reserved CHAPTER 10 Investment, Net Exports, and Interest Rates. Mr. Weiss Test 5 – Sections 5 & 6 – Vocabulary Review 1. financial asset; 2. New Keynesian Economics; 3. transaction costs; 4. velocity of money; _____the. Saving, growth and the current account Daan Steenkamp ERSA / SASI Savings workshop August 2009. 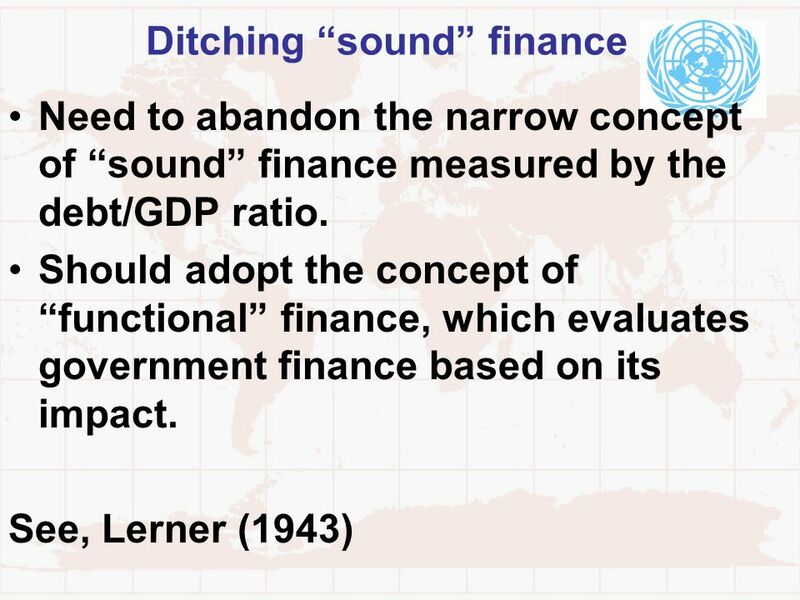 Principles of Macroeconomics: Ch. 16 Second Canadian Edition Department : Business Studies Inflation Inflation. 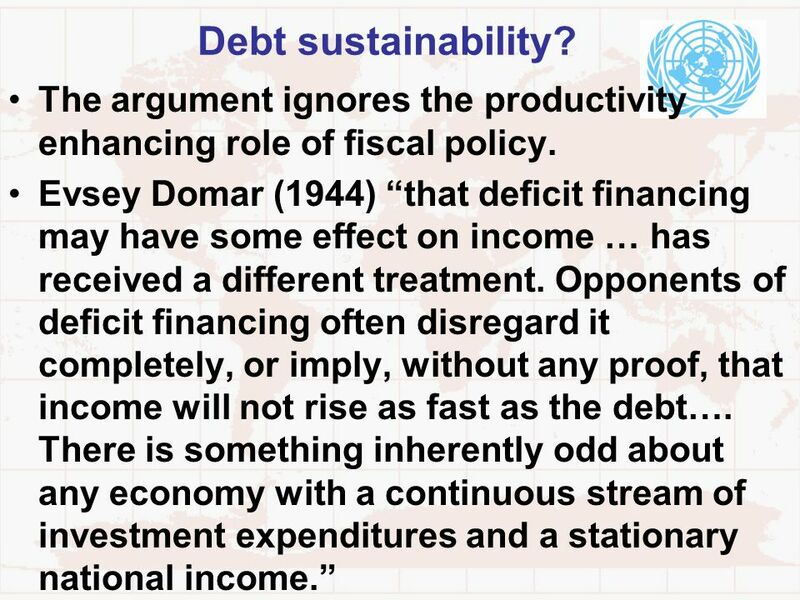 A Tale of Two Crises: Korea’s Experience with External Debt Management Paper Prepared by Professor Yung Chul Park Seoul National University UNCTAD Expert.